As you load the last of your belonging into the moving truck, unfortunately your hard work isn’t done yet. Before any relocation is complete, it is essential to thoroughly clean your house or apartment to pass the all important final inspection with either your landlord and or the new owners of your home. When there is an absence of any legal requirement to clean the house before moving out, most sellers will take special steps of their own to present the home in an acceptable condition, for the buyers or for handing back to the landlord or leasing agent. It’s understandable that after moving all day, sellers or renters will often be too tired to spend a lot of time cleaning but unfortunately that’s no excuse to not get it done. For this reason, having a “moving house cleaning plan” set in place is an important way to stay organised and clean efficiently after any relocation. Your first step in home cleaning before you move house as previously mentioned is to adhere to any specific cleaning regulations set in place by your body corporate, landlord, or real estate agent. Depending on what was stipulated in your lease, you may be required to steam clean the carpets, clean your oven, or even hire a professional cleaning service to do the work and show receipts as proof of work done. If time is money to you then Mooving Matters, your professional home organisers and movers that pack and unpack for you, are ready to lend you their expertise and decluttering services. How to clean a house you just sold or are vacating? We have all been there; the temptation to opt out on those last few cleaning chores is a force to be reckoned with! But don’t give in. How dirty you leave your home isn’t just about etiquette—it could also cause problems with the sale of your home if you are selling. 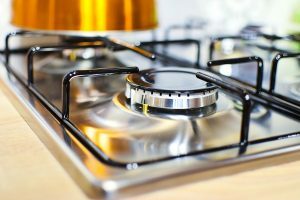 While buyers may forgive you if you forget to sweep under the stove, more serious offenses can have serious consequences. Check your contract: Some sellers may stipulate that the place be spotless by the time they move in. If you agree to this (verbally or in writing) and don’t live up to your end of the bargain, you could be at risk for a lawsuit. So if you leave the property in a filthy state, potentially any new owner could delay or even opt out of the sale altogether. Hiring a professional organiser and or decluttering and cleaning service can be an excellent solution. Sometimes, the real estate agent will pay to have the home professionally detailed cleaned. Wash the inside all windows. Clean windowsills and curtain rods. Wash the inside and outside of all doors. Wash marks and scuffs off the walls. Remove all nails from the walls. If you have one clean out the fireplace. Clean the blinds and light fixtures. Vacuum and shampoo the carpet or stem clean them. Remove and dispose all rubbish. Clean the dishwasher inside and out. Mop the kitchen floor – as well as areas underneath appliances. Clean the inside of the stove, top of stove, exhaust fan, hood, and bottom drawer. Remove stove racks and clean thoroughly. Wipe cupboards inside and out. Wipe out all drawers with a damp cloth. Wipe down counter tops and the sink. 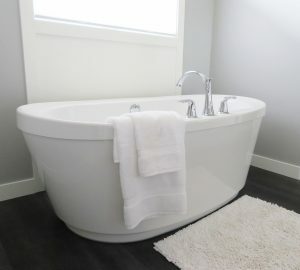 Clean the bathtub, sink, and fixtures. Clean the toilet inside and out. Clean the medicine cabinet and door. Stack items pertaining to the home such as paint cans, roofing materials or extra flooring. Check to make sure the buyer wants your leftover materials, first. Some do not. Mow the yard and trim shrubbery and plants. Dispose of all garbage via a skip bin or driving a trailer to the tip. The above basic moving house cleaning plan will definitely help you simplify your cleaning process. The time that it takes you to clean your house will depend greatly on the size of your home and the current condition that it is in. For the most thorough moving house cleaning, it is recommended to rent a professional carpet steam cleaner to remove deep dirt deposits from carpeting. Otherwise if you have the time you can rent an individual carpet cleaner for personal use. Mooving Matters your full service moving company are happy to recommend and source the best cleaners to leave the vacated property in tip top shape so that the new buyer is more than satisfied or landlord will happily return your bond. When it comes to cleaning, starting early is easiest. “Mooving Matters recommend doing a good scrubbing and decluttering before putting your home on the market. For many it can be very stressful to do at the last minute,” The very experienced Mooving Matters team can take this stress out of your hands with our specialised decluttering service done by none other than our professional home organisers. But if you didn’t start early, there is no need to panic. If you attack the job with a plan and Mooving Matters at your side, it’ll get done faster for sure. But basically just try to clean room by room, working from the top down. It’s the most neglected items that prove the hardest work and are often the most time consuming. Ensure you dust the ceiling fans, wipe down the walls, and then sweep, vacuum, or mop. Give a good once-over to the oven and stove—including the drip pans. And always check any air vents for filth or mould—in some instances you made need to call in a professional to inspect it. Once you’re done with one space, then only should you move on to the next. And don’t skimp on the details. How to clean the house isn’t the only thing you have to worry about before the final walk-through. With any strange odours, even if fleeting these can make the buyers think the home is unclean and even make them think twice about placing an offer. 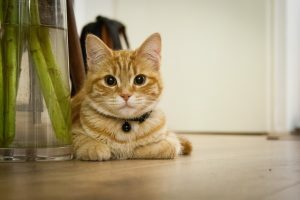 Even if you’ve already moved out, go back into the property for a quick sniff before any inspections are due to start. It might be a good idea to bring a friend along, as they might not be use to your old home’s scent like you are. Ask them for their honest opinion. Air fresheners can help to minimize lingering odours, but try and see if you can find and eliminate the source first. It is very common for many sellers to leave behind various unwanted personal items, some because they think the new owner may get use out of them or rather they just don’t want to deal with disposing them. But honestly who wants your old shower curtain and matching dust bin? The rule is unless the buyer specifically asked for it, just take everything with you. Always remember to a double check any attic spaces, basements, storage cupboards, and the garage for anything you may have missed. Don’t waste your time and always dust before you vacuum. Dusting without a doubt will stir up dirt and debris from any bookshelves and cupboards, which will then settle back onto the floor or other surfaces. After you have dusted, thoroughly cleaning any the nooks and crannies, all excess dust and debris can then be easily vacuumed away. Haven’t got the time and people coming by? Its time for some Speed Cleaning! The last thing you want to do is waste your precious time HOUSE cleaning! It’s usually anything but a fun activity to complete in your spare time. So below we have put together some methods to ease the pain, improve your end results and, most importantly enable you to reclaim your weekends & freedom. When it comes to a quick tidy before an inspection, the key is to “have a simple plan, multi-task, and get a room done one at a time”. At Mooving Matters we live and breathe this process. “Organisation is always the utmost the key”. Basically set yourself a time limit, have your products on the ready, and move from room to room efficiently. Think big picture and focus on where people will hover and walk through the home. Make sure to cover the areas that are important, this is not the time to detail clean the microwave or empty out the fridge, these can be left for another day. Set the clock, lets go! A proven ay not to waste time or getting side tracked is by putting yourself on the clock. Allow approximately 15 minutes in each room. Set a timer, to keep your eye on the prize. This method will help you achieve as much done as possible in a short time, so it is essential that you are constantly on the go. Focus on specific rooms. When people inspect, their time is limited to particular spots. This typically includes the kitchen, lounge room and bathroom. Concentrate on these areas. Before you start cleaning, it’s a good idea to throw any dirty / used towels and bed linen in the washing machine and hit go on the cycle. It’s a sure way to clear up the space and makes rooms accessible and easier to clean. Speed up the process by having all your cleaning products in a bucket or basket to carry from room to room. This way you are not wasting valuable time going back and forth to the kitchen for different products and devices as they are already with you wherever you are in the house. So get prepped to get set and go! Always look to do the bathroom and kitchen first as they are the big-ticket items, taking the most amount of time and interest by any potential buyer or renter. The Kitchen: Spend a minute or two decluttering the benches and putting items back in their place. It’s the less is more principle – the emptier your benches are, the cleaner your kitchen looks. Clean hard surfaces working from top to bottom. That way any debris that falls gets wiped up in subsequent cleaning. Wipe down the stove, microwave, and fridge. 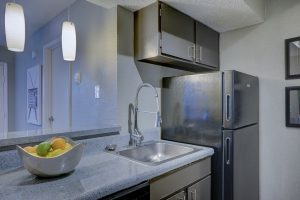 Pay particular attention to the good old sink, a clean sink does wonders to help make the rest of the kitchen sparkle. The Bathroom: Firstly spray the basin, vanity, shower and bath tub with an all-purpose srfacec cleaner and let sit while you tackle the toilet with a good scrub with the toilet brush and cleaner, let sit then flush. Lastly, spray a cloth with all-purpose cleaner and wipe down the outside of the toilet suite and pan. Next clean the mirror with glass cleaner spray and, starting in the top corner, wipe in a circular motion with glass cloth or paper towel. Go back to the basin and give it a good final wipe over. Lastly just wipe down the shower and tub, there is no need for a full scrub – just give them a quick swipe with a dampened cloth. Eliminate the Dust storm: Make dusting the all-round house cleaning time. Whilst you are dusting, look to tidy by put things away, placing toys in the toy bin – this is the mutli-tasking part of the cleaning process. While dusting, you are prepping that room to be vacuumed and finally mopped. It’s essential to start in one corner of the room, working the room from top-to-bottom and back-to-front so that the dust falls onto the floor. And if you have blinds, best to run over them with the long-armed duster. Get the Vac out: Start from the very back corner of a room and vacuum your way out the door, using long firm strokes. You can save time by only running the vacuum over each area of carpet once – not twice. It’s always a good idea to make sure the vacuum is empty and its filter cleaned before you start, it will make the job a whole lot easier and more efficient. Bye bye broom: Don’t waste time sweeping, use the vacuum for all hard surfaces, carpet and tiles. You only need one appliance – a vacuum – for all floors throughout the home, including bathrooms and kitchens. 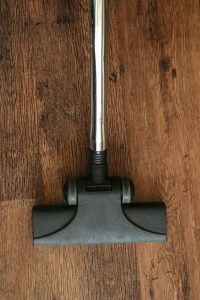 Sweeping is only getting the job half done as it doesn’t pick up all the dust and hair and should just be used for tidy ups in between if you don’t have stick vacuum. Clear the clutter: Quickly scan rooms to see what’s out of place. Stash scattered items like remotes and DVDS in drawers; neatly stack magazines on the coffee table or in bookshelves. In essence, leave the home in the condition that you would like to find your new home. Remember, the new homeowners might receive some of your mail or packages by mistake. It’s a good idea to stay on pleasant terms with the new buyers. And it’s also the right thing to do. If you need help to getting started on organising your move and clean up why not call on Mooving Matters your team of trusted and caring Professional Organisers. To arrange a complementary on-site inspection of your property by Mooving Matters, your home organiser Sydney or to simply discuss our ‘Ultimate full service packing + moving’ experience call (02) 93375333 or visit us at moovingmatters.com.au.